Welcome back for another season of The Road to Worlds. Around this time every year, we have a three-month stretch where each region of play for the various Star Trek card games gets to have its "big dance." Whether the players of your locale are rated 1800 or don't know their rating, whether your nearest regional attracts 4 players or 40 players, once a year everyone brings their best decks and competes for their regional title. I'm here to celebrate with the winners, ask them what they think, and analyze their decks. My ideal choices when I started preparing for regionals was Mirror Starfleet and TK inspired Romulans. I also had Relativity, Ferengi, and Klingon Riker solvers. My dilemma piles include ACE/TT, Legacy, a Persistant and a Chula pile. ACE/TT was the only other pile that was nearly as competitive as the standard attrition pile I paired with the Cardassian solver. I really only assembled this deck to use in testing against Starfleet and Romulans, I wanted something other than Klingon or Relativity to test against and the Cardassians performed very solid with no games having issues getting ships or personnel. The only tough matchups were against the ACE/TT pile, but I was hoping that there were enough new dilemma strategies out that ACE/TT would be less popular than it had been in the past. I wasn't too concerned about facing any draw decks in particular. 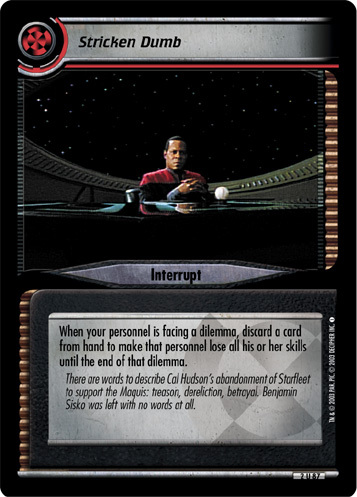 A TOS deck with Sisko would be a concern for my interrupts to get cancelled. Other than that, a control deck that would target my mission skills would be tough to beat as well. Michael Moskops use of Lustful Distraction came as a surprise in our game, but I was able to get my interrupts through and solve my mission. As I mentioned earlier an ACE/TT pile was my biggest fear. I really didn't have an answer to the mass killings that could happen when facing that type of pile. I played with one copy of Tacking Into the Wind hoping to shuffle back key personnel that might get killed in such a matchup, and my personnel costs were low so I could bounce back quickly. But I have enough experience against ACE/TT to know that that's not always enough for a win. A Legacy pile could have slowed me down as well, my dilemmas were just over 30% non-skill, so if I didn't have The Central Command in hand, a Legacy player would have had a good chance to stop me. In the Decipher-era I was almost a Cardassian-only player from the start. Especially after Reflections 2 was released and Tain and Goran were available, I played an Integrity based cheater/solver that caught several people by surprise and I had some good tournament results in 05/06. 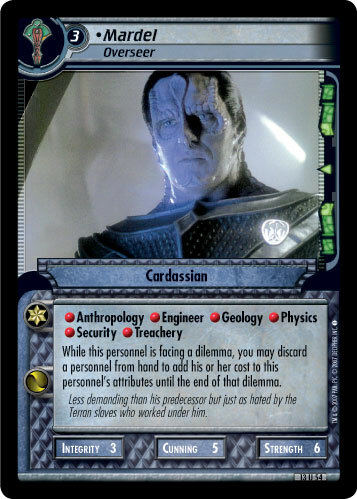 Once An Issue Of Trust came out, Cardassians really didn't have much of an answer and became far less competitive. Playing this version (which I copied from you I might add) really took me back to some of my favorite memories of playing this game. While many of the cards were different than what I used in the past, this deck played like a straight up cheater-solver which is something I feel very comfortable with. The Central Command gives the Cardassians an answer to AIoT, and people are experimenting with piles other than ACE and TT lately, so I felt the time was right to give them a try. Tacking would be useful in every game. There's always at least one Event worth destroying, and it's nice to have the security of getting key personnel back from the lost pile when you need it. Dukat happened to show up in all of my games and his mission skills always came in handy. I don't think I would change the draw deck at all next time. Infatuation would likely come out of the dilemma pile, that was a last minute addition that I had wished was Guess Who's Coming to Dinner when my opponent was attempting in space and I also had Gomtuu in my drawn dilemmas. The Weak Will Perish and Unconventional Consideration are cards that I added that I hadn't used much in the past. I couldn't play The Weak against Jeremy's Klingons, but other than that, both dilemmas were effective in all my games. I had Outclassed in my dilemma pile and never drew into it. It wouldn't have helped me against Brian's Voyager, it would have only worked on one of Jeremy's Klingon ships, and it would have been nice to draw against Michael's Starfleet, but it decided not to show up today. Comfort Women and The Central Command are what make the draw deck win. No single dilemma seems to be a star, but they all are pulling in the same direction and were effective overall. Just that I'm glad we have an excellent website and people who post decks like this for others to see and use. I'm at a point in my life were the time I can spend on this game is at a minimum, so being able to have access to tons of decks and tournament results is one of the major elements that makes this game still playable for people like myself. Well, yes, Al's right, I am quite familiar with this particular deck, and can talk about it at length. However, full credit for the creation of the original deck should go to Len Neidorf, who has been terrorizing the Boston area with it for years. 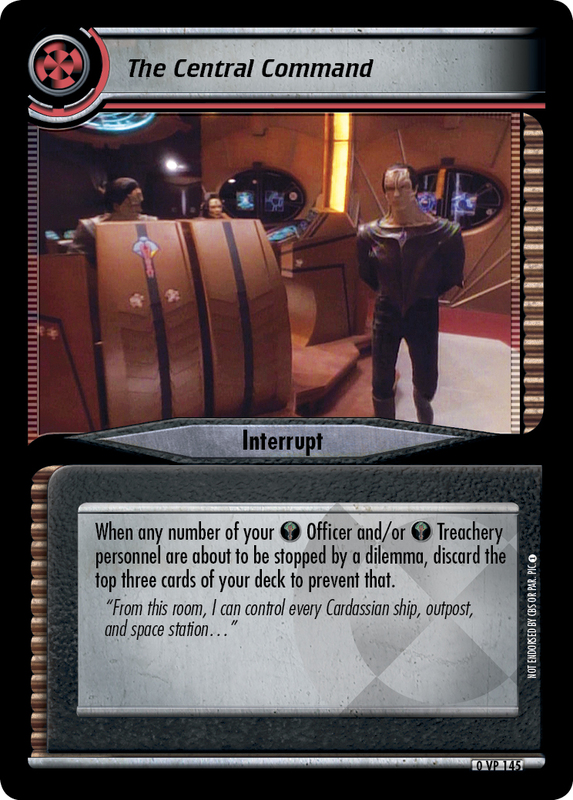 The Central Command is easily the most potent tool in the deck; not only does it overcome the Cardassians' natural vulnerability to An Issue of Trust and Personal Duty, but it also essentially pulls double duty and fills the "prevent and overcome" role of Bridge Officer's Test for wall dilemmas. With the Officer/Treachery density found in this deck, things like Outclassed and even Gomtuu can be torn through like tissue paper. Sure, Gomtuu will leave some damage on your ship if it is Centralled, but who honestly cares when your space mission has a span of two and is in your headquarters region. That said, it's not hard to beat many wall dilemmas even without TCC. This deck has a veritable cornucopia of dilemmas busting cheats: Dukat and Lore are alternate sources of stop prevention, Garak, Parek, Gav, Oran, and Comfort Women all provide potent skill gain, and attributes can be easily boosted with Comfort Women (again) and Mardel. Mardel is, I believe, an oft-overlooked piece of the Cardassian toolkit, whose ability can be used multiple times per dilemma and synergizes nicely with the deck's draw engine. What really drives the deck is its speed and, through These Are The Voyages, the ability to routinely have 3-4 interrupts in hand prior to the initial space mission attempt. Being able to surprise an opponent by blowing a hand full of interrupts on a turn 3-4 one-shot solve is usually enough to win the game against most other speed decks (which don't have the situational cards needed to slow you down from there) and control solvers (which often won't have enough tools in place to prevent 3-4 interrupts that early). Once your space mission is out of the way, the penalties for failing to solve in one attempt drop off sharply (Sean O'Reilly's Orlando Masters deck notwithstanding). Al's change to the deck - dropping The Crystalline Entity in favor of Tacking Into the Wind - is one I made originally when borrowing Len's deck for a road trip down to Virginia, but is a change I have since reverted, and here's why: with the density of interrupts, and the desirability of those interrupts in the early game, it is easy for this deck to suffer from hand clog. Tacking has to be held until needed, and The Crystalline Entity can be played and used later, reducing the number of important cards you need to hold. Also, those "gotta-hafta-destroy-now" events tend to come out early, and TCE is two cost cheaper at that point in the game. That said, at Worlds I never once played TCE, but could possibly have used the recycle function in my game against Neil (though it would have likely been discarded before it was needed). Al's right though, this deck has no direct answer to kill-based dilemma piles. Such decks aren't an automatic loss for this deck due to the ability to spam out more cheap chumps, so a solver that is paired with a Tragic Turn pile is a slog but doable. However, if someone's terrorizing your area with this deck, I might recommend a more interference-heavy strategy. Even though it's outside of our comfort zone up here in the Frozen North, that's what we ended up needing to do, and it was quite successful. In general, I prefer to play Borg, but have been wanting to play something else lately. 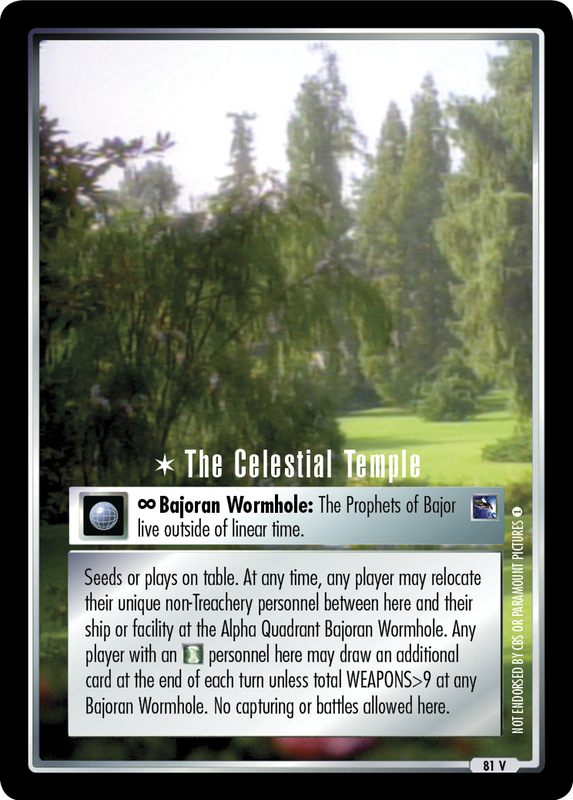 Having recently played Here By Invitation in a block event online, I was reminded of a Return Orb Bajoran deck that I had played in the way back days. I don't generally think in these terms. Usually I'm just happy to be playing the game. If there is one deck type I don't care to play against, its lock out. While this was the first time I played this specific deck, it was very similar to my old Return Orb deck and to the deck I recently played online. I spent a fair amount of time practicing with the deck, so it played pretty smoothly for me in the tournament. I think my biggest learning experience this event was with Quantum Incursions. This was the first time I played with, and against it. Its ever changing nature provides an interesting twist to mission attempts. I was using some, Contain Boarding Parties for DS9 protection, Type 18 Shuttlepods for Outgunned protection, and Borg Nanoprobes for the recently returning Your Galaxy is Impure. None were used in this event. Despite that, I would find it difficult to cut them. I think I am going to give this honor to The Celestial Temple. Beyond the built in card draw, this was helpful in all of my games. I had seeded DS9 at the wormhole in each game and the ability to move people between sites without walking came in handy several times each game. Also, getting an early Rescue Personnel completed on it helped to ensure I would have cards in hand for free plays or report with crew drops and a few bonus points. Artifacts have fallen out of favor lately, and it is easy to see why: they come at the cost of fewer dilemmas to slow your opponent, or of fewer seeded jump-start cards to speed you up. That makes it extra cool for me when I find a winning deck that has not one but two seeded artifacts. After all, in a meta where it is worth seeding dilemmas for your own bonus points, if you're going to solve missions in multiple quadrants anyways, why not use Off-Zel Vase? Now sure, this deck isn't going to make "Z" grow above 1, but even "just" 15 points for one seed can easily be worth it. The other artifact, Orb of Wisdom, is not just a mobile free-play engine (take that, Kazon fleet!) and attribute booster (for the hardest stat to boost, integrity) - it is also a source of bonus points through HQ: Return Orb to Bajor. And, if the bonus points aren't enough, I'd say it is worth some bonus cool points if you can seed it under one of your opponent's stealable missions, and acquire it without completing the mission using the aforementioned objective. In any event, with the multitude of bonus point sources available to Jeremy, I doubt he ever needed to solve more than two missions to win. Speaking of using an artifact-based free-play engine, you may have noticed that the "play engines" category for this deck is very long. That's because Jeremy has cleverly woven in a number of situational and/or non-seedable engines. Sure, there's no way to download First Minister Shakaar early on, but his special skill applies to many of the personnel who report for free already to the Chamber - thus, it isn't like you are counting on him showing up, but he can greatly increase your personnel output when he does. 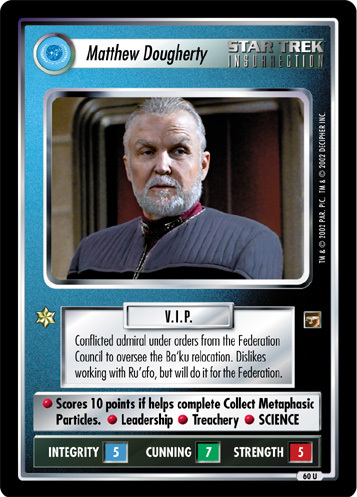 Also, engines like the Shuttlepod and the Bajoran Raider may cost your card play, but they can also be used on a select few personnel who wouldn't report for free in any other way but have nice skill lists - personnel like the achievement-enabling Mora Pol. You may have noticed that I classified We Need You Here as a draw engine while it technically doesn't draw you any cards. Well, it allows you to use your Ops download in place of your card play without losing your draws, and as long as that download isn't coming from your hand it might as well say "draw a specific card, then use your card play on it" which to me sounds even better than just drawing some random card from your deck. We Need You Here gives Here By Invitation decks unparalleled dial-a-skill, and as long as those decks don't mind using the regular card play on dialing that skill, I'd say it counts as a nice seedable draw engine too. And hey, with two seeded draw engines, that meant Jeremy didn't have to worry about clogging his deck with card-play based draw engines like Handshake or New Frontiers. That's a good deal. Right! Masters results! The Orlando masters event was this weekend, which is what motivated me to take the family down here in the first place. I'm glad I did, since the tournaments were fantastic (thanks to the tireless efforts of Rick Kinney, Sean O'Reilly, Daniel Matteson, and Eric Robinett), and my daughter is loving getting spoiled by her Nanna and Daddo (one benefit of being the first grandchild is you get to name the grandparents) who live down this way. I was planning on playing a Weenie Terok Nor deck with almost all personnel for multiple attempts (possibly at different missions) each turn, but since I'd been rewatching the "Star Trek: The Next Generation" blu-ray's, I decided at the last minute to build a TNG deck. I'd seen some very annoying two mission win decks and decided I wanted to build one. Attribute boosting McCoy and the Enterprise-J made the high point missions very easy to solve, and also meant fewer dilemmas to face. I wasn't really hoping to face any specific kind of deck, but I really thought more people would be trying to use the Phoenix or Causal Recursion to require me to have more points to win the game, so I made sure that I was immune from the latter and the bonus point ships meant I wouldn't care about the former. There also weren't decks that I didn't want to face until after I played Sean who showed me how ridiculous Bajoran Assault can be. I really didn't want to play against any more of those after that game. I built the deck three days prior to the tournament, so no. I'd played TNG quite a bit, and have done a couple two mission win decks (primarily assimilation), but this was my first go at a pure solver two mission deck. I would do practice draws with it to figure out what I really needed to get into play early, but as a whole, my first game at Masters was the real trial by fire. I knew I had a good skill mix and plenty of mission skills, I suppose my biggest worry was getting ships into play, which is why I had six of them in the deck and four more cards that could download one (Picard and Tacking Into the Wind). The only situational card I had was a dilemma, Tormented Dreams. I had two of them in the deck, and removed one at the last minute. People often leave personnel at home or stopped personnel at other missions, but I think I was only able to use it once the whole tournament. I'd likely remove it if I played a similar deck again. As for cards that exceeded my expectations, the good old Stricken Dumb was helpful in every game that I recall. It helped me get a ship in the discard pile for Sha-Ka Ree, helped me skip around a few dilemmas, and in the final game it guaranteed me only one kill from The Clown: Guillotine (who was then saved by an ETU). I'd have to choose the Enterprises (A, C, D, and J). It's cheating a little since that is technically four cards, but the bonus points from each ship made the deck a two mission winner (and if an opponent played A Few Minor Difficulties, I had two more to choose from) and the J let me complete high point missions with very few personnel. It did much better than I thought it would. I like to at least test a deck in a tournament before playing at a big event, but I just didn't have the chance. It was a lot of fun to play and was a nice change from the decks I often build. Other than removing one dilemma, I don't know that I'd want to change it all that much (if at all) for improvements. On the day prior to the tournament, I was talking to people at the warm-up event about dilemmas, and it came up that Geoffery Peterson is one of the few players worldwide who uses Curt Reprimand in decks that win tournaments. I love seeing that sort of thing, because it gives me something specific to talk about; Curt Reprimand is in fact a good dilemma. Sure, In Development extends the effects to 2 cost personnel, and Coolant Leak is a "skill dilemma", but Curt Reprimand is cheaper than both of those and can more easily set up a combo to really punish the opponent for bringing the weenies. Now, Geoffery was part of this conversation, and this winning deck of his does not include it - whether that is a result of the conversation we had or not, it does make me a bit sad to see it go. Fortunately, Geoffery stocked another great but very, very underused card in Stricken Dumb. The applications for it in slipping another personnel past Personal Duty or An Issue of Trust are obvious, but it has lots of other clever uses too. For example, say All-Consuming Evil just got consumed and your opponent is going to surgically remove your one anthropology. Well, just strike that Anthropology personnel dumb, and the dilemma just whiffs. In his report, Geoffrey mentions the application of using it to discard a ship mid-attempt for Sha Ka Ree, but imagine your opponent is about to strip you of a personnel using The Caretaker's "Guests" while your discard pile is empty. Just strike someone dumb, and voila! The surprise factor of using a sneaky-good card like Stricken Dumb is just what a two-mission win deck needs. Because you're going to win with one fewer missions completed than most decks, your opponent is going to be trying to make every dilemma they throw at you count, and when you fail to solve it will be by a hair. Stricken Dumb can give you that extra inch, but so can numerous other things, like the William T. Riker from Necessary Evil. Also underplayed due to his skill list, but has one of very few stop prevention options available to TNG decks. Or maybe it could be the also rare-to-see I Need a Little Counseling - Security Drills may have more uses on the face of it, but interrupts are surprises, and sometimes that's what you need. But what about dilemmas? Well, you're in luck, because there's a Tormented Dreams in there! An unsung hero of Unnatural Selection, Tormented Dreams won't do anything if your opponent has all of their personnel at the mission that they are actively attempting. Now, sure, there are only a handful of decks that intentionally keep people at home all the time anymore, but that includes the still powerful Romulans, which is a match-up where you could really benefit from a 2 cost chosen stop. That's not the only time that you'll get the dilemma to hit though; think back to your last tournament. How many times would you play more personnel, then attempt without swinging by home to pick them up so that you could potentially pick them up for next time? How often have you had 10 people in play when you've wanted to go off to a space mission and needed to leave one or two behind. I know I'll be trying this dilemma out in my next tournament. Note: this section was written before I received Geoffrey's feedback, wherein he suggests that he wouldn't use Tormented Dreams next time. I'm going to leave it here, because I still plan on trying it out myself. 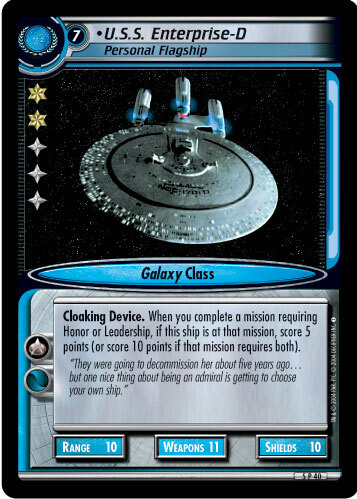 The reason I chose the deck I used was I was extremely comfortable with the Enterprise E crew. They have tons of tricks that adapt very well against multiple current strategies that are prevalent in the current meta. Plus, who doesn't love the Bridge Crew. I was actually considering using a couple of different things: I considered Borg, Maquis/Bajorans, DQ Equinox/Hirogen, and/or TNG Federation with some supplemental free plays. In the back of my mind, I still love my DS9 Ferengi and I was dying to get the Dominion/Ferengi Alliance (Where Opportunities are Made) card in a game but there just wasn't enough time to adapt to the new changes. I was hoping to play against decks with not a lot of interaction. The deck handles interaction well however it moves much faster when not having to dodge a Kazon Warship. I really didn't want to face the Kazon battle deck. I knew that Justin knew how to play it very well and I thought that it would be an option for him to choose out of his arsenal of decks. I knew after the first round there was at least 1 Kazon deck because I over heard someone say "I will fire on your Outpost and blow it up". So I knew the Kazon were there however it wouldn't be until the end of the day that I found out there were 2 Kazon decks in the tournament. The Kazon deck is hard to beat. However, myself and Jeremy Norris (Arcanthas) had been practicing against a Kazon Battle scenarios to prepare for their likely attendance at this event. One card that I seeded and never used was Call for Reinforcements. I anticipated needing to Download a ship or repair a ship with the Meta being so aggressive and the Enterprise E being such a juicy target. However, the situation never came up. Never underestimate a well timed Cytherians. I despise Cytherians. Don't get me wrong, I use it sometimes but it is a card that I constantly build decks to deal with it. However, It was very handy in my game against John Paul Veasey. I actually think I would add 1 or 2 cards to the deck if I was to play it again. I can honestly say it was different in every game. Game 1 vs. Lucas Thompson - it was Handshake - Lucas had a very mean combo that killed a lot of my people. Without Handshake I would have been unable to get more people out to play to recover from the MASSIVE death caused by his combo. Game 2 vs. John Paul Veasey - Cytherians and the Son'a Battleship were my saviors here. John's deck was very fast. John left his S.S. Xhosa in just the reach of my Son'a Battleship and I was able to take a pot shot at it to cut down on its range. This would turn out to eventually be instrumental in the winning of this game for me. My well placed Cytherians caught John late in the game. This eventually lead to him taking a trip on his fully crewed U.S.S. Nebula. It delayed him just long enough for me solve and take the lead in the last 4 minutes of the game. Game 3 vs. Justin Ford - It was a combination of cards in this game that were my MVPs. With the impending Kazon threat, I knew land-able ships would be a must. So my Delta Flyer and my 2 Runabouts were crucial. Also, Evade Borg Vessel kept my outpost safe from destruction. Game 4 vs. Sean O'Reilly - It was Matthew Dougherty. Even though he discards Federation Flagship: Relaunched he was worth it because he helped me solve Collect Metaphasic Particles for an Extra 10 points. Sean was playing point-loss dilemmas. On my first mission attempt, I lost 9 points to The Higher... The Fewer. I completed another mission for 35 points putting me up to 35-9+35=61 -- So I needed 39 points to win with 3 missions. I went for Insurrection with the alternate mission requirements of Collect Metaphasic Particles with Matthew Dougherty for 45 points for the win. No, but I would like to thank the Cardassia Crew for their hospitality, and planning of the events. Extra special thanks for the AMAZING trophies! (Wow just wow they were beautiful) I would also like to thank Eric for having us at his awesome store. As has been said on the Forums: Orlando is a great place for large events for so many reasons. I really hope there are more events there in the future! So, I may have named my deck Free Report Salad after a humorous and insightful post from Matthew Ting, but if my deck was a salad, Ryan's is a Free Report Five Course Gourmet Meal. Not only are there a whopping seven fully staffed play engine, they are some of the most skill-dense engines in the game with personnel like Chakotay, Data, and Ru'afo joining forces. Two of these engines have a roaming report location, one of the play engines comes with a built-in draw engine and, to top it all off, all ships in the deck either seed or are free, freeing up that card play to be used on Handshake whenever he needs to refill his hand. Skill-density is not all that the personnel in Ryan's deck bring to the table; there are several "heroes" that I'd like to spotlight. In our game, Deanna Troi's unstopping ability turned a devastating failure to pass Friendly Fire into a game-swinging attempt at a new mission. Likewise, Jean-Luc Picard's download of Make It So can do the same thing - but fortunately only at a space mission, since he didn't come out until after Ryan had solved a couple. Bareil can come into play via a Temporal-Microwormhole, and can download any of a wide array of game-winning equipment, and Ru'afo can start a download cascade ending in a double turn and Deanna Trois all around if you Collect some Metaphasic Particles. When I hit the second The Higher... The Fewer, I remarked to Ryan that he must not have the same fear of the Borg in him that I do. At the time of our game, I'd never beaten the Borg in a tournament (the streak has finally been broken since then! ), and eschew point and gender-related dilemmas for that very reason. He admitted that he'd made a tactical decision, based on who was attending, that he was unlikely to face the Borg. Though there was one Borg deck in the tournament, Ryan did not end up facing it, and his gambit payed off; against non-Borg decks, point loss is a very effective dilemma strategy, capable of forcing most opponents to solve one more mission than they planned on. Beyond the point loss, I see a persistent stall theme among Ryan's dilemmas. For example, Ferengi Bug doesn't act as a full wall, but the only decks that are likely to pass it in one shot are Original Series-based decks (and those are fairly uncommon). It may not have a chance to buy more than one turn, but being able to near-guarantee a single turn gain over your opponent for only one seed slot is pretty potent. Likewise, something like Chula: The Game gets discarded, but has fairly picky requirements that many decks won't pass up front, and it can stop the opponent for a full two turns. Okay, back to the beach! You guys have fun, play trek, watch Daniel's podcast, and I'll see you next week for another busy weekend on The Road to Worlds! Note: My apologies for the paucity of card links. Adding all the links is a much more time-consuming process on the laptop I'm using, so I had to make the decision to skip them this week. Note #2: Rick, I'm sorry, I borrowed your pen to track my Soong-type Androids, and never gave it back. Well, I'm sort of sorry, because it is a good pen.